Bacopa also known as Brahmi is a component of Hi-memory Formula. Brahmi means creative energy. It is widely known for cognitive enhancement and memory improvement. Modern researches evidence its ability of enhancing thinking process, learning capabilities and improving memory functions. 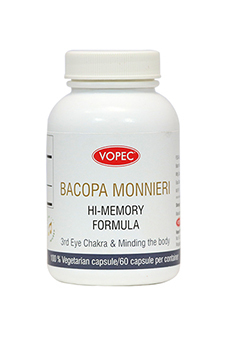 Bacosides of Bacopa makes this Hi-memory formula highly effective for cognitive functions. It is well known as neuroprotective & neuro regenerative herb because of its ability of improving blood supply to Brain cells.Its cognitive boosting capacity is due to the enhanced transmission of nerve impulse. Improves verbal learning, memory consolidation & speed in early information process. Suppress oxidative stress of brain cells. Hi-memory formula is uniquely infused with 3 rd Eye Chakra activating phonemes to enhance the potency this herb.